Prominent & Leading Manufacturer from Chennai, we offer tensile umbrella, hanging umbrella, side pole pool side umbrella, corporate promotional umbrella, side pole umbrella and red and white umbrella. Our umbrellas are made from water proof material and are long lasting. Our colorful umbrellas provide maximum protection from sun rays. Our range of umbrellas includes, party umbrella, beach umbrella, garden umbrella, promotional umbrellas etc. 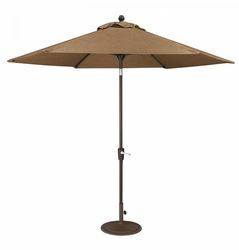 We offer a wide range of Hanging Umbrella at very affordable and reasonable prices to our esteemed clients. Umbrella surface spray treatment, with cross-shaped base. Corporate umbrella it is used for many corporate offices to improve and promote their business. Used their official function, this is, also called as promotional umbrella. 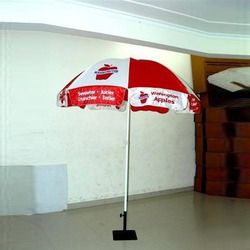 We offer a wide range of Red and White Umbrella at very affordable and reasonable prices to our esteemed clients. These umbrellas are big in size and provide shelter against heat, sunlight and rain. 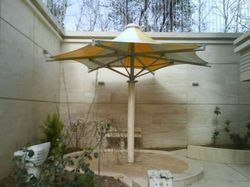 We offer a wide range of Square Umbrella at very affordable and reasonable prices to our esteemed clients. These umbrellas are big in size and provide shelter against heat, sunlight and rain.